Long Lake and Raquette Lake are communities rich with history and a fascinating past. History is ever evolving, whether its knowing where a special camp was from the 1960’s to the discovery of the Buttercup on the bottom of Long Lake. There are rich traditions in these woods. Here is a smattering. The Town of Long Lake was first settled in the 1830s by Joel Plumley, David Keller and E. H. St. John. Plumleys and Kellers still reside in Long Lake. The first houses were log cabins until mills were established. The first mill, owned by St. John, was near the South Pond outlet in Deerland, another was the Robinson mill on the stream at the beginning of Endion Road, and another was near Fishing Brook on the way to Newcomb. Raquette Lake is part of the Town of Long Lake. Its first settlers, William Wood and Matthew Beach arrived in 1840. Circa 1855, Wood gave his property to Amos Hough of Long Lake in exchange for his care until death. From a History of Hamilton County (HHC) “A primitive hotel opened in 1857, the Raquette Lake House. It closed in 1873 and part of the structure was moved to Forked Lake becoming the Forked Lake House. “ Alvah Dunning, woodsman, arrived in Raquette Lake in 1868. He settled on Indian Point then took possession of camps on Osprey Island in Raquette Lake. 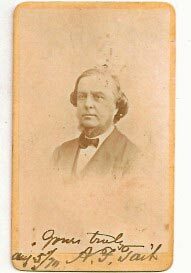 The next dignitary to arrive was Dr. Thomas C. Durant, the railroad magnate and father of William West Durant who was responsible for the design of many of the Great Camps in the Adirondacks. According to HHC, “More than any other community in Hamilton County, it was primarily the summer people who brought the principality of Raquette Lake into being. Its continuing economy was built almost entirely on resort life.” J. Pierpont Morgan acquired Camp Uncas in 1896 from William West Durant. The Vanderbilt family built Great Camp Sagamore also a Durant design. Both of these camps are now National Historic Landmarks. LIVING AND LAYING THE LAND. Travel between the outside world and Long Lake was difficult. “The nearest physician, store or even gristmill was forty to fifty miles through the forest on a rough footpath. (HHC)” Local travel via lake and stream was conducted by dugout canoes or heavy skiffs and later by lighter guideboats in the warmer months, and in winter the frozen lake allowed visits to friends on the opposite shore. Guideboats were invented in Long Lake. Their design evolved over a period of years, each builder contributing his improvement. The Rev.John Todd, author of an 1845 book about Long Lake, mentions the little boats coming to church services in 1842. Long Lake was formally incorporated in 1837, and the first town meeting was held at the home of E. H. St. John. James Sargent was named Supervisor. Harman Keller was the Town Clerk. David Keller was named Assessor, Commissioner of Schools, Overseer of Highways in District #1 and Justice of the Peace. Joel Plumley was named Assessor, Commissioner of Highways, Inspector of Schools and Justice of the Peace. The town was sparsely populated and those present performed numerous offices. There was no post office or hotel or grocery store. The first school “commenced November 8, 1841 and was kept for one month and twenty days.” By the late 1840s goods and produce were brought in from Newcomb by wagon and this was the main route out to civilization. In 1846, Amos Dean published a pamphlet promoting the Town of Long Lake to potential settlers. “It will be found an excellent country for grazing, raising stock, and producing butter and cheese. . . The strength of the soil is sufficiently tested by the heavy growth of timber.” His effusive praise proved to be somewhat exaggerated. By 1850, the population had reached 157 residents. All were farmers except for a joiner, a surveyor, a hermit and a hunter who gave his occupation as “nothing.” Four stores and a hotel sprang up in 1860. The first post office opened in 1863. Visitors to Long Lake in these early days were C. W. Weber, a sporting naturalist who passed through in 1849 and William Waddell who came in 1858 and reported a “nice schoolhouse, comfortable framed houses and valuable farms.” By 1860 the Champlain-Carthage Road opened and more and more sportsmen came. Lumbering became more prevalent as farming waned. The Civil War was felt in this isolated part of New York State. Some of the eligible Long Lake men joined the 93rd Regiment including Benjamin Emerson, founder of Long View Lodge, and husband of Livonia Stanton, and Josiah Houghton and David Henry Rice. Ransom Palmer, thought to have killed the last native Adirondack moose in 1861, lost his arm in the Battle of the Wilderness. In 1869, Rev. William H. H. Murray wrote a book called Adventures in the Wilderness or Camp-Life in the Adirondacks. It was a very popular book and went through eight printings its first year of publication. Many of the tales in Murray’s book are set in and around Long Lake and Raquette Lake. The tourist edition of the book printed maps of the area and train schedules. Consequently there was a rush to the Adirondacks by tourists often referred to in the popular press, as Murray’s Fools. As a result of Murray’s book, hotels large and small opened for business, Great Camps were built by notables J. P. Morgan, the Vanderbilt family, the Whitneys, Henry S. Harper and politicians such as Judge Green of NYC and Senator Orville Platt from Connecticut. 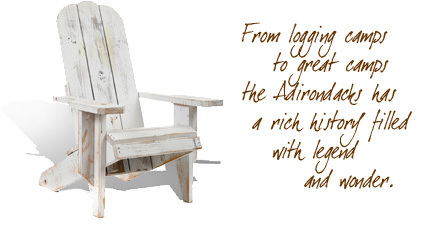 The tourist economy of the Adirondacks, still in existence today, was launched.. The artist, Arthur F. Tait arrived in 1870 and built a camp on South Pond. Later he moved his family to the west shore on property that became the Freund camp. One of his children was born in Long Lake, Arthur James Blossom Tait in 1875 and Francis Osborn Tait was born in New York City in 1880. As a result of the massive influx of tourists from the publication of the Murray Book, it was a strong catalyst for A.F. Tait making his camps deeper and deeper into the woods to seek the isolation and find the solitude he needed to create his beautiful works. Long Lake harbored quite a few hotels and in 1882, the largest, the Hotel Sagamore started to take shape on a bluff on the eastern shore of the lake, south of the present town center. It finally opened in July 1885 but burned down in 1889. The second hotel opened in 1891, boasted 200 rooms. Much of the money to rebuild came from the sale of Town of Long Lake bonds, an “unofficial and slightly questionable” acknowledgment of the role tourism played in the economic health of the town. 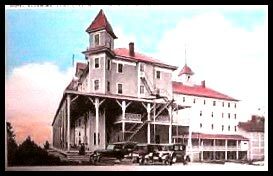 The hotel closed in the 1950s and was torn down in the 1960s. Before the present bridge was erected, there was a floating bridge (1871) which offered precarious passage from one side of the lake to the other, next came two bridges including an iron bridge completed in 1901, then in 1933, a dam and causeway were built creating Jennings Park Pond. The project eliminated the necessity of having two bridges. Prior to this, ferries transported passengers back and forth. There was one at Endion another transported fares from the end of Tarbell Hill Road over to the west shore. Steamboats also provided transportation between Deerland, the town proper and the hotels at the north end of the lake. 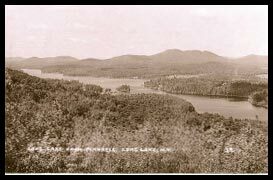 A significant event was the creation of the Adirondack Park Agency in 1971 which oversees land use in the Adirondacks. This was and continues to be controversial. Opponents accuse the agency of having a negative effect on economic development and forcing residents out of the Park. Proponents argue that without the Agency, development would be rampant and the character of the Adirondack Park would be destroyed. Today, Long Lake and Raquette Lake still depend on tourism. The Parks Recreation and Tourism Department of the Town of Long Lake holds year-round events in both towns from Fourth of July fireworks in the summer to snowmobile races in the winter. Fall brings the leaf peepers, and Labor Day supper and music in the Mt. Sabattis Pavilion. Spring brings the fishermen, fishing derbies and later in June, the black flies. Screened porches, netting and bug dope are advised in June or reservations for indoor imbibing at the various restaurants and hotels in the two towns. For a complete schedule of events and a list of businesses check this website.